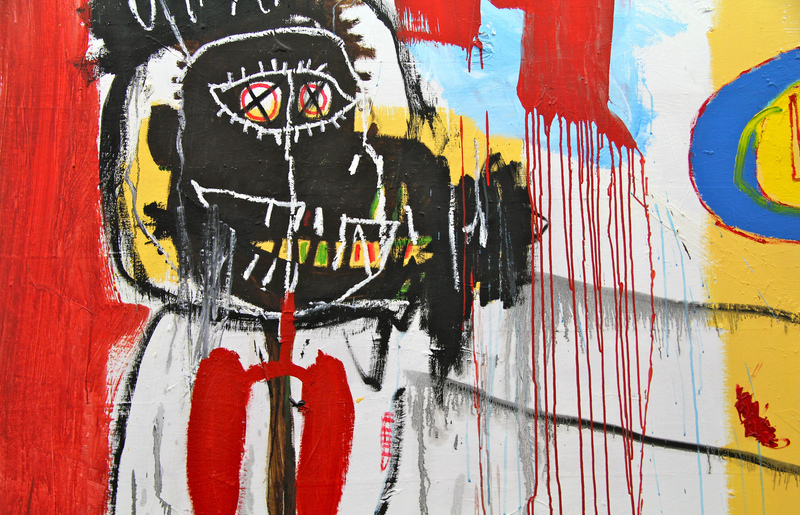 How many artists of Basquiat’s background would make it in today’s art world? Jean-Michel Basquiat’s Le Jour ni l’Heure, detail, 1988. Courtesy of Renaud Camus. For years, I have been writing about the works of Latino/a artists in a variety of media that focus on the construction and representation of their ethnic identities. This investigation has led me to explore the commonalities and differences in the visual representation of racially constructed Others more broadly, and I keep reaching the same conclusion: no visual representation of people of color is ever innocent or powerful enough to challenge the socially defined images that frame them—depending on the given illusion—as marginal, as threats, as foreigners, as Others, as having too much culture or too little culture. On their own, artistic representations can do little to challenge racism. It takes structural change to create a visual revolution that can fully change and destroy our illusions. Though Latinos/as in America are hyper-visible in mainstream imaginations as stereotypes, icons, and figments of social fears and projections, they are invisible as complex, artistic humans. Scores of cultural critics tell us that this seemingly puzzling situation is the product of history. Long-enduring representations born of racism and political disenfranchisement make it almost impossible to see beyond the illusion, which presents every image of people of color within a rubric of race. This is why debates over the relative merits of positive versus negative representations have proven so futile: any image that circulates in a racist and hierarchical society is bound to be a contested illusion. no visual representation of people of color is ever innocent or powerful enough to challenge the socially defined images that frame them. Unfortunately, abiding inequities in the arts are elided by an even greater illusion in the American imagination: the illusion of equality. After decades of multiculturalism and “post-racialism,” today we pride ourselves on our diversity. Big wins—like the all-people-of-color cast of Hamilton nominated for the most Tony nominations ever, and the high profiles of select visual artists and curators of color in major museums—have many people cheering the diversity gains of the art world. Yet any artist or cultural activist of color knows the dirty truth. As the art world becomes more a terrain for financial speculation and an engine of growth for the much-hyped “creative economy,” most observers admit that it has also grown less diverse and more unequal. In particular, Latino/a art and artists are disregarded by both North American and Latin American art history, institutions, and curators. Ignored by the White-centric North American art canon and the nation-centric paradigms that dominate Latin American art, Latinos/as seem to fit nowhere. This erasure continues despite historical efforts by Chicano/a, Nuyorican, and Latino/a art movements, advocates, and institutions to challenge it through the creation of culturally specific art spaces and museums. One classroom example forcefully makes the point that diversity, in the form of a greater breadth of visual representations, is not the same as the lack of racism. In my seminar on ethnicity and media at New York University, I ask students to search for Internet images using the phrase, “Latino art,” following the lead of Nancy Parezo’s research on Native American art. Just as Parezo’s search exposed the dominance of typically western landscapes and Native Americans depicted in an idyllic, mythical past, searches for Latino/a art reveals the dominance of bright colors and imagery of the Day of the Dead and Frida Kahlo. From the search results, one would think that Latino/a artists are all Mexican or only used passionate colors. Most of my students immediately get the point, but, to highlight the complexity behind clichéd representations, I push the exercise further, asking them to review past and present exhibitions in local or national Latino/a art institutions, or to identify or interview a Latino/a artist they may know or have heard about. Most importantly, this exercise always leads to a fruitful and revealing conversation among my students, of whom a significant number are aspiring artists of color, ready to share the frustrations they regularly encounter within the dominant racial landscape. diversity, in the form of a greater breadth of visual representations, is not the same as the lack of racism. Today, as movements like Black Lives Matter foreground discussions of racism in everyday society and students challenge the racist legacy of universities and the mantle of high culture in which they are vested, we are overdue to address the history and mechanics of racism in the arts. Only through this work can we go beyond the illusions that dominate our perception, treatment, and recognition of people of color and their artistic contributions. This is the racism that continues to diminish artists of color and their work to clichés and the rubric of identity politics, which has entitled curators and critics to talk about Latino/a art and artists of color without authoritative knowledge about the vocabularies, aesthetic traditions, backgrounds, and resources of these artists. Racism is behind the unspoken practices that limit the hiring and recruitment of people of color as professors and the admission of students in art schools, that see in them only clichés and illusions while denying them universal access. In this context, art and artists of color are recognized only as ethnographic subjects or as political statements to entertain the White liberal establishment; they are less expensive but less valuable and less worthy of being shown than the White artists. So let us not be fooled by the false illusions of equality that come from the hyper-visibility of marketable and sanitized images of Latinos/as or by the occasional gain of a breakthrough artist or cultural production. Latinos/as make up 17 percent of the US population, and it is estimated that by 2040 Latinos/as will be the majority minority of the country. But how many people of color were present at the most recent art fair, museum opening, or master-of-fine-arts class? I doubt it was 17 percent, unless it was an exhibition or performance produced by an artist of color. And even then they may still not be present—because who can get access to a ticket to Hamilton? Arlene Davila is a professor of anthropology and American studies at New York University. She writes on Latino/a cultural politics; her multiple books include Latino Spin: Public Image and the Whitewashing of Race (NYU, 2008). As the co-founder of a Latino arts organization, I can attest to the inherent inequality that exists in the arts field as a reflection of the inequality that exists in society. My own experience was that the inequality was usually subtle and nuanced, though occasionally overt. Probably my epiphany came at a grants workshop where we attended along with mainstream arts organizations. One mainstream arts administrator mentioned that his organization reached a $500,000 operating budget in its third year of existence. I knew then, and I know now, that it would be incredibly difficult for a Latino arts organization to do the same. On point! Ms. Davila is unapologetic about the state of the arts and where Latinos finds themselves neither in the white canon nor the Latin American one. I don’t think anyone is under the illusion that we are post-anything just because Hamilton is on Broadway or Jane the Virgin on TV- both those references have their faults. The exciting point is that they are. I remember reruns of “Chico and the Man” or seeing Rita Moreno on “The Electric Company” as my only reference of “me” outside of telenovelas on Ch. 47/41 (and those images are still contested). Breaking the signifier’s power is difficult. I guess our task as artists is to keep the momentum moving forward and beyond.